Revel in me...: Pink flower earring. I came home from work quite early today, and I thought I would have a night of just resting and chilling out. T_T Blinking my eyes in unease at the sunlight (I can't remember the last time I finish work before sunset!! ), I marched off on my journey home with a bounce in my step. Btw, I buy both the Singapore and Malaysia's copy of Cleo. 'Cause nothing much to do in S'pore wtf. 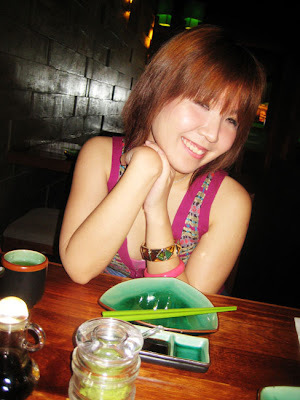 Whom I entrusted with my dear beloved white Miu Miu. That proves the extent of my love wtf. I kept on darting nervous glances at her and barking warnings: "Watch where you put the bag! ", "Are you sure your dress's coloring won't rub off on my bag!" Hahaha, paranoid wreck wtf. I am telling all of you, never ever invest in a white bag!! It will be one of the most gorgeous pieces in your collection, but it will be a white elephant! No pun intended wtf. 'Cause every moment that you carry it out, you are just stressing out when you are going to dirty it. T__T I swear, I could get a nervous breakdown from it!! Trying very hard to snap a picture of my pink flower earrings, which I concocted my whole outfit based on it wtf. And finding out later that the only way that anyone can see the earrings is if I cocked my head at a 45 degrees. Dammit! Why cannot see the earrings! Err. I think the only way is if you tuck your hair behind your ears la. Hah! But I will look like a geek wor! 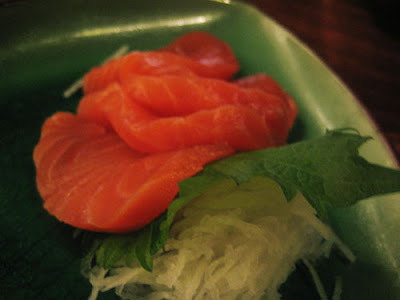 We went to Sushi Groove in OU! Initially, we went to Delicious, because Jing said she has to match her tea roses dress to a English tea theme. -___- But after we sat down, we found out that Delicious was practically out of everything! Bah, so annoying. So we left (my suggestion *droops head*), and decided to try out Sushi Groove (Jing's suggestion) instead. 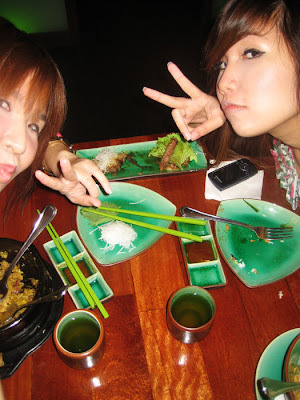 But not without Jing commenting "Haih, actually hor, Japanese food doesn't match our outfits today" WTFF. Got possessed wtf (unfocused eyes). 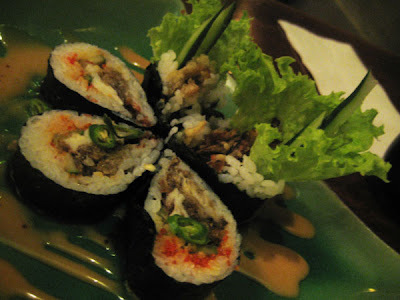 Soft shell crab sushi with chilli padi. 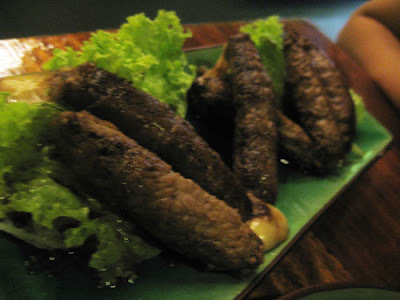 Mushroom and mozarella cheese wrapped in roasted beef slices, and served in a BBQ sauce. 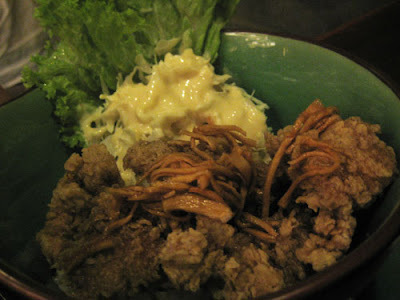 Jing's main meal: Fried ginger chicken don. 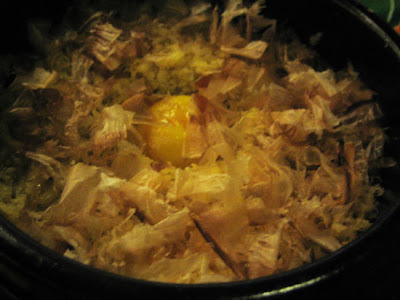 It is actually curried rice in a hotplate, and those are dried squid (or is it octopus) shavings on top! 'Cause of the heat, the shreds were moving when the plate was served to me. Very geli! It looked like an underwaterworld WTF. 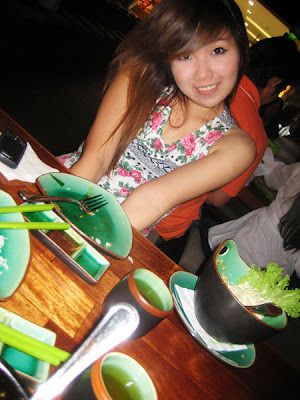 Acting demure before attacking our food. 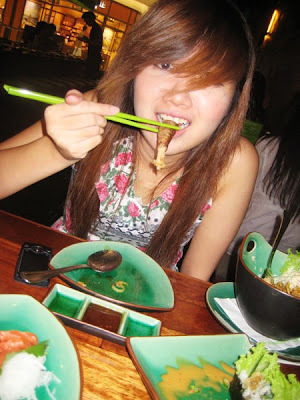 Jing eating the extremely obscene-looking beef-wrapped thingy, haha. 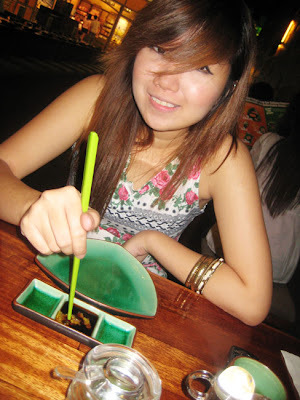 'Cause I found damn a lot of pictures of Jing in the same bent-sideways pose in my camera wtf. Determined to get at least one clear picture of my earrings! And this is my 'What's for dessert?' face. hi can i know where u do ur facial? You're always adorable!! Still looove your outfits, hehe. hahh... aren't those shavings of a fish?? omg ure an april baby too! When will you be back in Malaysia for your study break? ANDDDD are you celebrating the big 24 in Msia or in Singapore? This is pathetic..I have to catch up with you via your blog because you are too busy on msn. Bah. mustardqueen: Not that ex meh! Jing said very ex wor... And err dammit, I KNEW I spelled it wrongly, but I was too lazy to google for the right spelling, haha! smalls: Can't I just buy a cactus for the house or something! :P I will be back the weekend after my b'day, for a week! *can't wait* And arghh I KNOW.. It's so annoying! I hate work, omg. this is random, but would you recommend flying to KL from SG or by a coach? yesjune: Thank you! <3 Hmm, in terms of traveling time, it's almost comparable ('cause you have to take into account check-in time, travel-to-airport time etc)! If you are very tired, I would say take bus, 'cause can sleep in the bus wtf. 'Cause if you go by plane, you have to be constantly on the move! But of course, if you can get cheap air tix, then fly la, it's easier and (slightly) faster! To snoop or not to snoop.